(CNN) -- Authorities in Colorado say criminal charges are expected to be filed against Richard Heene, a storm-chasing father whose giant Mylar balloon ascended into the sky earlier this week, sparking fears that his 6-year-old was aboard. 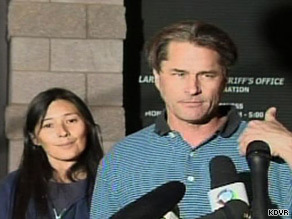 Richard and Mayumi Heene leave the Larimer County Sheriff's Office Saturday. "We do anticipate at some point in the future, there will be some criminal charges filed with regards to this incident," Larimer County Sheriff Jim Alderden said. The saga captured the nation's attention early Thursday afternoon, after authorities reported the family's homemade helium balloon was set adrift, apparently with young Falcon Heene inside. Since then, speculation has mounted over whether the incident was a hoax by the father, who has appeared with his family on ABC's "Wife Swap," and posted videos of storm chasing and other activities online. Earlier Saturday, in an impromptu press conference outside his home, Heene told reporters the runaway balloon incident was "absolutely no hoax." The incident prompted a widespread search in northern Colorado that included law enforcement from several counties, the Federal Aviation Administration and the Colorado National Guard. It ended when Falcon climbed down from the attic above the garage at the family's Fort Collins, Colorado, home. If the incident was a hoax, the only charge local authorities could press would be making a false report to authorities -- a Class 3 misdemeanor, Alderden told reporters Saturday. However, a misdemeanor "hardly seems serious enough given the circumstances," the sheriff said. "We certainly want to talk to FAA officials and federal officials to see if perhaps there aren't additional federal charges that would be more appropriate in the circumstances than what we're able to do locally," he said. He said further details would be disclosed Sunday morning, and that neither Richard nor Mayumi Heene, who came in voluntarily Saturday, was under arrest. The couple emerged Saturday evening from the sheriff's office after several hours of interviews with investigators. "I was talking to the sheriff's department just now to further things along," Richard Heene told reporters outside the building. "We're doing well." He refused to take questions before the couple drove away in their minivan. "I got people e-mailing me, calling me; they've got a lot of questions, and I don't know how to quite frankly answer any of them other than I've got a box," Heene said around 10 a.m. He said he'd answer the questions later Saturday night. "I'm going to place the box up front. Please write your questions down," he said. "I have no idea what the news are saying. I don't have cable." Speculation began to mount over whether the incident was staged after the family appeared on CNN's "Larry King Live" on Thursday night. Heene asked Falcon why he had not come out from hiding when his parents were calling for him. "You guys said we did this for the show," the boy said. Heene said his son was confused when he made the "show" remark. There were media assembled on the front lawn asking all sorts of questions, and that's what Falcon was referring to, Heene said. Alderden said Friday that -- based on reports that the parents "took these children into potentially dangerous situations" with tornado chases, the experimental balloons and other activities -- it would be "appropriate to involve child protection [services] to at least see what the family situation is and whether the children are in a safe condition." Earlier, the sheriff told reporters his department contacted child protection officials but asked them not to contact the family until investigators had a chance to re-interview them.